Almost no other plant screams as loudly “Spring is just around the corner!! “ as the cheerful sight of a Flowering Quince in full bloom in the dreary winter landscape. Native to eastern Asia, Japan and China, Flowering Quince is highly adaptable to growing well the United States, including Texas. Because of its Asian origins, an old-time name for the plant was Japonica and the pink and white blossoms of Flowering Quince and its fruit are often depicted in Japanese paintings. 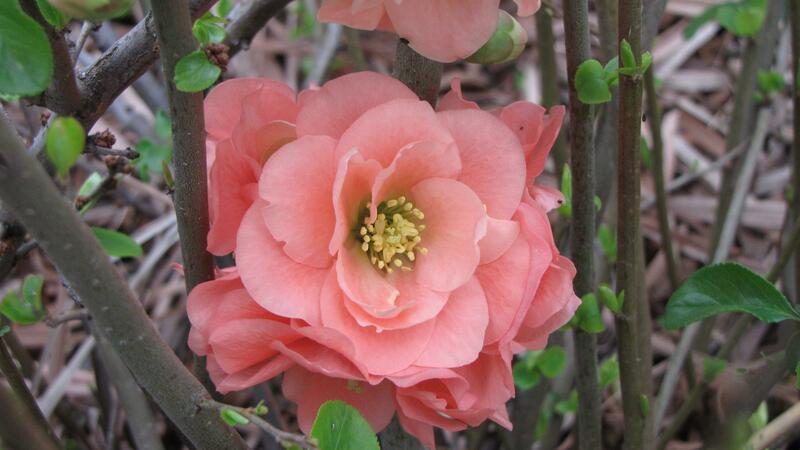 Flowering Quince, genus Chaenomeles, can range in size from 2-10 feet tall and wide depending on the variety. They tend to be a rounded shrub and nearly all have thorns, though some of the newest varieties are thornless. Except for their brief moment of glory when they bloom in shades of red, white, pink or salmon in late winter, they are a nondescript, glossy green shrub which some consider too ungainly and rambling to be given a prominent place in the landscape. They are very hardy, will live for years, and require only moderate maintenance. In highly alkaline soils they may become chlorotic but even in Dallas County this does not present much of a problem. Though some of the newer varieties are said to grow in partial shade, the more sun they are given, the more flowers they will produce. Here at the Demonstration Garden we grow a variety called Texas Scarlet Flowering Quince, Chaenomeles japonica ‘Texas Scarlet.’ It grows from 3-6 feet tall and wide and has very fiery tomato-red, apple-blossom-like flowers that precede the deciduous leaves. After blooming it produces a greenish-yellow fruit which can be harvested in the fall. It is considered best when used in a shrub border or as a background plant. The fruit of Flowering Quince, including Texas Scarlet, can be used to make jellies and jams. The fruit is very hard and must be cooked before eating; and the seeds, which contain amygdalin, must be removed before cooking. Because the fruit contains more Vitamin C than lemons, in Estonia, it is called a Nordic Lemons. There are several recipes for Flowering Quince jelly on the internet. However, because of the small size of most of the fruit from ornamental varieties, most cooks consider it too labor intensive to make jelly from varieties such as Texas Scarlet. Though nurseries are carrying Flowering Quince now that are in full bloom, just remember that glory of these shrubs may only last for ten days to two weeks. 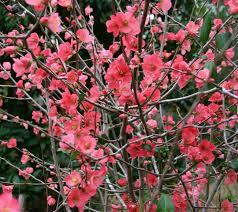 However, if you plant and establish Flowering Quince now, just wait until next year. You will be greeted with a flamboyant harbinger of spring. Posted in Spring and tagged Deciduous Shrubs for Texas, Flowering Quince, Texas Scarlet Flowering Quince. Bookmark the permalink.